Posted on September 25, 2017 at 3:33 am. 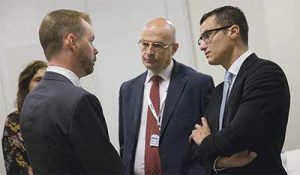 Kindred Group CEO Henrik Tjärnström, CEO of the Foundation for Social Welfare Services, Alfred Grixti, and politician, Silvio Schembri, Source: Times of Malta. Responsible gambling was on the agenda for over 270 representatives who came from all around the world to Malta for the Responsible Gaming Conference 2017. The Kindred Group, which is the parent company for online casino 32Red among other gambling operators, held the sold-out conference in conjunction with Social Welfare Services, at the InterContinental Arena Conference Centre last week. In its second year, the conference saw online casino gambling operators openly discuss responsible gaming, with a focus on the benefits a regulated gambling industry can bring, which is often ignored by the media. Parliamentary Secretary for Financial Affairs, Digital Economy and Innovation in Malta, Silvio Schembri, addressed the conference, stating that the gambling industry is worth more than €1.2 billion to the Maltese economy and supports more than 9000 jobs. He added that the Maltese government is investing in responsible gambling policies and tools, and will use €1 million from the European Social Funds to treat local gambling addicts. Kindred Group’s CEO, Henrik Tjärnström, spoke about the importance of data when it comes to understanding gambling behaviour, and highlighted the need for gaming companies to ensure the appropriate support measures are in place for players. “Responsible gaming is an area we consider a key building block in our sustainable business strategy and therefore a topic we will continue to drive,” he said. Minister for Social Policy, Michael Falzon, congratulated Kindred Group on its responsible attitude towards gambling and proactive approach to preventing addiction in the gambling industry. Keynote speaker from Nottingham Trent University, Mark Griffiths, discussed his research into problem gambling, a project he has been working on with the Kindred Group. He revealed his analysis of the structural characteristics associated with gambling and gamblers, as well as his thesis where he states that to minimise gambling harms, betting and online casino operators should look at the two most important structural characteristics – accessibility and event frequency. The conference also featured a panel of four former gambling addicts, including Frankie Graham, John Hartson, Ian Semmel, and Justyn Larcombe, and a University of Malta psychological counsellor, Paul Sciberras. The former problem gamblers recounted their experiences and shared insights into their recovery process, which was moderated by UK academic Jonathan Parke. Other panels focused on responsible gambling in the gaming industry, including discussions by gaming operators, researchers, psychologists, regulators, authorities, and treatment agencies. Meanwhile, the Foundation for Social Welfare Services CEO, Alfred Grixti, said the organisation aims to reduce and prevent gambling addiction, but he was concerned with the decreasing number of people seeking help. General counsel for Kindred Group, Ewout Keuleers, closed the conference, stating gambling companies are responsible for protecting players and preventing problem gambling through education and awareness. He warned operators that problem gamblers are not valuable customers as they aren’t sustainable. He added that operators and gambling organisations/charities should team up to address problem gambling issues and tackle them through the use of innovative technology solutions. “Player safety has to be in the DNA, part of the organisation’s values and embedded throughout the business to create a safer and more sustainable environment for customers and the industry,” he said.